The titular star is the famous race horse who ... well, if you don't know who Secretariat was, I'll leave you to discover it in Randall Wallace's sun-dappled story, set in the early 1970s. 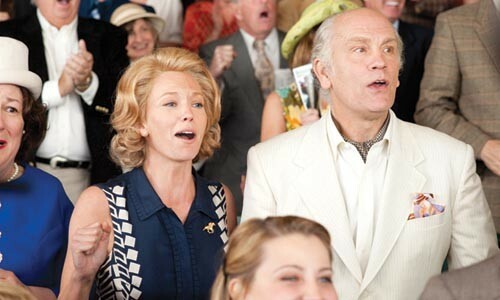 The horse matters, but the real star is its owner, Penny Chenery (Diane Lane). (For once, the star of a Disney inspirational is a middle-aged woman!) In a time and a sport that frowned on women participating, Chenery (politely) fights to keep her father's horse farm and to train Secretariat, whom she believes is a champion. In her corner, a sartorially challenged trainer (John Malkovich) and her dad's faithful assistant (Margo Martindale). Even knowing the outcome, and despite the film's obvious staginess, I found the story engaging, and Wallace did his best to make the race scenes exciting. This is the genteel side of horse-racing -- all pretty hats and roses, with no big piles of poopie, unnecessary profanity or unseemly gambling. Starts Fri., Oct. 8.